Cogstone was contracted to document five historic-era buildings through photographs and descriptive text on behalf of The Accelerated School for a project located in the South Central Los Angeles Planning Community in the City of Los Angeles. The Accelerated Charter Elementary School Project will involve the demolition of five now-vacant buildings on a 2.294-acre urban site and subsequent construction of a 52,109-square foot school. A previous Phase I study conducted in 2012 determined that two 1906 single-family houses and three warehouse buildings dating from the 1920s and 1940s were not eligible for listing on the California Register of Historic Resources and did not rise to the level of City of Los Angeles cultural monuments. The mitigation measures developed for the project stipulated that salient elements of the historic buildings be photo-documented and described, and that any significant architectural elements or pieces of equipment be salvaged from the buildings prior to their demolition. 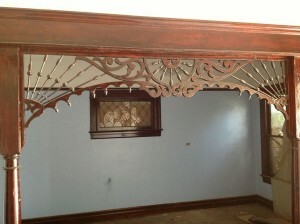 Cogstone recommended that one item be salvaged: the spindlework living room arch from the Queen Anne style house. 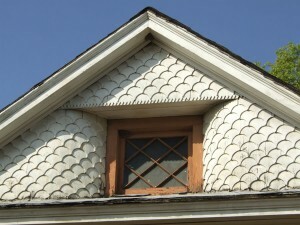 While spindle work decoration is very common to Queen Anne houses of the late 1800s and early 1900s, it is most commonly known on the exteriors of homes. 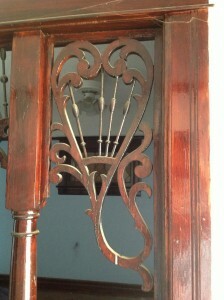 Less frequently, it adorns the entryways of interior rooms. The piece is composed of wood, stained dark to resemble mahogany. It is trimmed along the outer edges with wide molding. It is symmetrical, with a central, delicate arch of fan and scroll motifs, flanked by one column on each side with square upper and lower segments and tapered, round middle section. Cogstone consulted with staff at the Heritage Square Museum in Los Angeles, and museum staff dismantled the arch that day prior to demolition of the residence.